I know that Cineplex Coliseum near Bayshore mall and Empire theaters in Kanata play hindi movies every now and then, but they usually play the big releases. I doubt that Dedh Ishqiya will be playing there, but you might get lucky I miss Vanocuver in this regard. They played every damn hindi new release in multiple theaters there. ^ And I've just moved here a couple of months back!hehe. I used to live in Vancouver as well...My family still there though. and honestly, I've never watched any Indian movie beside SRK's, but I used to see them showing all of them there! Hope I won't struggle with SRK's films here after all! Let me try my luck on this one first! Thanks for the information. I watched the 2013 version of Chashme Buddoor the other night, and it was not that good. The jokes weren't very funny; I think I laughed a little like once or twice, and the acting was pretty lame too. The movie seemed outdated. Maybe if it released like 10 or 15 years ago I might have liked it, but otherwise I wouldn't recommend it. That was dumb. the only thing good about it was madhuri. It's worth watching for madhuri dixit. Her screen presence is just beautifully amazing. Other than that, the film isn't that good. Doesn't have too much of a repeat value. Last night I watched Gori Tere Pyaar Mein and it wasn't too bad. I wasn't expecting much from it because I didn't find the promos that great and I thought Imran and Kareena's last movie together was pretty boring, but this one wasn't bad. It kept me entertained. Nothing amazing, but a good time-pass film. Zoya's and Anurag's films were blah. Dibanker's was nice but what a film from Karan Johar. What a performance from Rani Mukherjee. Easily my most favorite film of the lot. The use of old hindi songs was beautiful. And the dialogues! Masterful. Would you like to come in? Would you like to come out? Brilliant little gem from Karan. Cannot wait for his next film with Shahrukh. While in India went to see Dhoom 3....Aamir's acting was laughable. He had 2 expressions, scrowling eyebrows and goofy and I mean Goofy from the Disney cartoons....what a shame. I actually didn't think the story was too bad, but Aamir has become a cartoon character with his acting....sorry it just wasn't any good....agree with the 3/10. Good fast-paced action film. What stands out is the male lead, Vidyut Jamwal, who's a great action-hero and displays a great range of stunts and fighting techniques. Much better than the current 40+ actors (akshay, salman and ajay etc) who indulge in OTT action. The first half seemed to be a regular rom-com. But the intermission got me interested as to how the story would progress. And the second half was excellent. It was the most insane love triangle I have come across, and it really worked well. These were 3 really confused people, but very real too. Pari was awesome. Gotta love her free, honest performance. Sushant was good too. Loved the first half - absolutely lovely. But SLB spoiled the movie with the second half. The ending was plain stupid and made no sense. Plus there were too many unnecessary twists and too many random things happening. Deepika was fabulous though. Ranveer was good too, but he got completely overshadowed whenever he shared screen space with Deepika. She has improved leaps and bounds since OSO and is now officially my favorite actress in Bollywood Visually, the movie was spectacular. The songs and choreography were just amazing. I liked it. It's mainly a pleasant and unusual journey that flows along blissfully and touches the soul. It's one of those films that takes time to set in and requires understanding. It isn't everyone's cup of tea, some may find it boring and slow and and many would find it unappealing because of its lack of commercial value. Acting wise - Alia,which I wouldn't have expected after watching student of the year, delivers a great performance and is the soul of the film. Randeep Hooda fits his role perfectly and is flawless. HIGHWAY - 10/10. Two words define this movie - LIBERATING and HONEST cinema. This review will be LONG ! I think the verdict on this movie will be very split. It does not have a story in the conventional sense. Highway takes the audience on a journey without forcing any emotional cliches and drama on them. Its not a spoon-feeding session, where you are told explicitly what the characters are thinking. Imtiaz leaves the interpretation open to the audience. It can either be a very cumbersome experience because you might feel that what is the point to all this. OR, you might find this movie to be an exceptionally rewarding experience. It was the latter for me and I was really able to connect with the characters, the journey and the narrative. It was as liberating for me personally as it was for the two main characters. Performances: After Student of the Year, Alia was truly a surprise package. I was stunned by this powerhouse performance from her. She was absolutely uninhibited and was able to portray her character's journey and transformation in the most honest way possible. I think she has the talent to out-act and out-perform all her contemporaries. Her outbursts during and post climax will hit you right in your feelers. Cannot imagine any other present day actress who could have done this role with such conviction. A real Patakha Guddi. Randeep Hooda. Damn. This guy is something. He has very limited dialogues, and thats because his silence itself says so much. He has acted the hell out of this role. I hadnt watched any movie of his before. But I am a fan after this. His outburst over the maggi scene really shook me. Hope he does a movie with SRK one day. Lastly, the movie is visually stunning. Made me re-realize how beautiful my country is. I agree with the second half of your comment, but you have to blame the ending on Shakespeare not SLB. I thought that the way it ended (don't want to put a spoiler in) mirrored the miscommunications of the original play. In Shakespeare it is news arriving too late which causes their deaths, which is the same here in many ways. I totally agree about Deepika; she is my absolute favorite. While it is a charming story, albeit slow in parts, it felt very much to have been made specifically for western art house cinema which is exactly where I saw it. Lincoln Plaza Cinema, in NYC, shows only art house films in many languages. And while Lunchbox has been praised as showing a slice of the real Mumbai life of the middle class, it sometimes felt like it was self-consciously and deliberately explaining things. The performances are outstanding, all three of the main characters, so it is worth it for that. I'm not sure about the ending and would love to hear some comments about that. English Vinglish - Nice sweet film. quite predictable but endearing. Sridevi was amazing, super natural. Dev D - Boring with nothing to get excited about. I was thrilled to watch this one as it is a new interpretation regarding Devdas. It felt flat and thought the background music was too much. Even the dubbing was visible and ruined some real moments while I was watching. Kalki Koechlin was terrible in acting comparing to the leads. I thought I would love this film but I didn't. Paa - couldn't continue watching the film, maybe I will next time. I just couldn't digest Vidya ( which I still searching on what the fuss about her) and Abhishek at all and the narration was quite mediocre! Kahaani - good movie. I like it. Ishqiya - I enjoyed this one, and I loved the music. Both the lead men were spot on. Vidya was good, though she came across like acting the same to me after I have seen her in a couple of films! Raanjhanaa - what a mess! Still don't know what the main point of making this film! bad lead actress even the lead actor ( who I was defending here in this forum!) was a letdown in projecting any anger or intense emotions. He is just cute naive looking...And the story looks like a mix of various stuff with sudden songs! Just plain WTH moment for me after I finished the movie. Omkara - I saw this film before and I felt like watching it again. I still LOVE this film. Dishkiyaoon - Decent one time watch. The fascinating thing is I downloaded it the day after it came out (this recent Friday) and the print was near DVD quality. Hope RCE/YRF take care to stop such good prints leaking out for HNY. Luck By Chance is a Farhan Akhtar film which I just watched for the second time. I really liked it and it gave an interesting take on the seamier side of Bollywood without going too far. 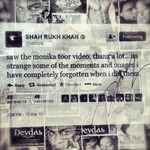 But, for you SRK-ers out there, it is worth the special appearance of his at the end. I think it's a tiny glimpse into what must happen when he goes to filmi bars or restaurants and I think the advice he gives is really from the heart. I wouldn't be surprised if it was improvised. OK, I gave in and tried to watch Krrish 3, if only because RCE had won awards for the special effects, and SRK is so proud of them. I tried, honestly... and yes, the special effects were excellent. But the movie itself was just unbearable for me. The whole thing was dumb beyond belief. As a science fiction lover from childhood, I know that the most outlandish plot devices will work if they are basically consistent and logical within the world of the story. This was just plain stupid! And besides the plot, or lack of one, I just cringed at poor HR trying to play a mentally handicapped genius. and at Vivek Oberoi trying to play a villain! Not to mention his lame crew of sub-villains! Awful! I got about halfway through it and had to quit for the sake of my sanity. Watched Bhaag Milka Bhaag last week. Farhan was really good. It's a shame he won't be in Raees - what a talented all-rounder he is. An enjoyable rom-com. The performances of Parineeti and Sid are the best things. The songs are great as well. A decent entertainer. The first half is very entertaining and fast-paced but the 2nd half drags and isn't as fun as the first half. what are your thoughts on this movie, guys? Lunchbox (8/10) Saw about a month ago. Nice movie, reasonably realistic. I had the feeling it was going to end less 'happy happy' but they decided at the last minute not to go the sad route, leaving it ambiguous instead so the viewer could choose her own ending. I could be wrong, of course. English Vinglish (9/10) A very enjoyable watch, Shridevi was delightful. The plot was well written, made sense, very slice-of-life. Nice! The folks in the English class were so well drawn, they felt like a group I'd like to know! Dea, I haven't seen it, so you tell us YOUR thoughts. i really enjoyed it and i think it's really funny and nice at the same time so i recommend it! Saif gives a great performance in this movie in my opinion. don't know what to say about the new girl, didn't really impress me. Deepika kind of has a supportive role here and she was great. i think she's getting better and better!